What better way to start the Holiday Season then with this last hoorah at fall? Yes, we do have some more magical fall weddings heading your way soon, but Autumn & Bart's encompasses everything we love about the fall season. So if you love those deep, warm tones the passing season brings us, you're sure to love EVERYTHING about this wedding. We knew from the very moment we met Autumn & Bart that they would be a magical couple. In the middle of Odd's Cafe with warm coffee and the summer's breeze, they shared with us the vision for their wedding. Without a venue in placed, they booked us for the fall and we followed them along their journey. Our next meeting was also low-key - an engagement session at Carrier Park, a spot that they visited often. Nearly a year later, they were wed. When Autumn emailed us with their official venue choice, I couldn't be more thrilled! Fontana Village is where I first visited the mountains way back in the day - I have so many wonderful memories visiting the dam and walking the hilly roads. Being a part of Autumn and Bart's day felt like coming home. True, the memories made me partial to this gorgeously stunning venue, but getting to make my reunion to this place with one of the most genuine and thoughtful couples was really the best experience. This jaw-dropping place wasn't only significant to me- Autumn also had special memories there. Not only did it seem like a practical choice for the outdoor-loving couple, but it promised to be the perfect getaway for their friends and family, as well. "We also wanted this to be a fun weekend getaway for all our guests, not just for us." But there were deeper reasons for choosing Fontana. "...My late father loved coming to this area to go camping and hiking, so it felt like a nice tribute to him as well." Before the ceremony, we got to sneak the wedding party away for some gorgeous light-filled photos. The catch? Autumn and Bart were waiting for that walk down the aisle before they could see each other. With lots of laughter and high anticipation, we snuck the girls away first to capture some photos by a historic log cabin Autumn adored. In these moments, their relationships really shined through. These girls all interacted as though they were family, with laughter and giggles and the happiest of memories. Usually, the groomsmen can be a bit harder to pull out of their shell. Not in this case! Bart's men were fun-loving and full of life. They even had fun idea after idea for their photos and just couldn't stop laughing (the best thing ever). Seeing Autumn & Bart with their closest friends just confirmed what we already knew - this couple has something special. With the ceremony time drawing near, we packed up and drove to the ceremony location just a few minutes away. Right next to the dam, their ceremony site overlooked incredible mountain views and provided a intimate-feeling setting to connect with the couple and nature. Autumn and Bart waited until the traditional walk down the aisle to see each other- and for their wedding it was absolutely perfect. One of my favorite photos from the day came about from that pause, separate from each other. Autumn & her brother wait patiently just outside of the woods, waiting for the cue to join her love. And man, was Bart's reaction perfect! Grinning from ear to ear and holding back tears, Bart was filled with joy. To Autumn and Bart, family was a crucial part of their day. I loved witnessing the gentleness and regard they held for each other, and their sweet reactions every step of the way. 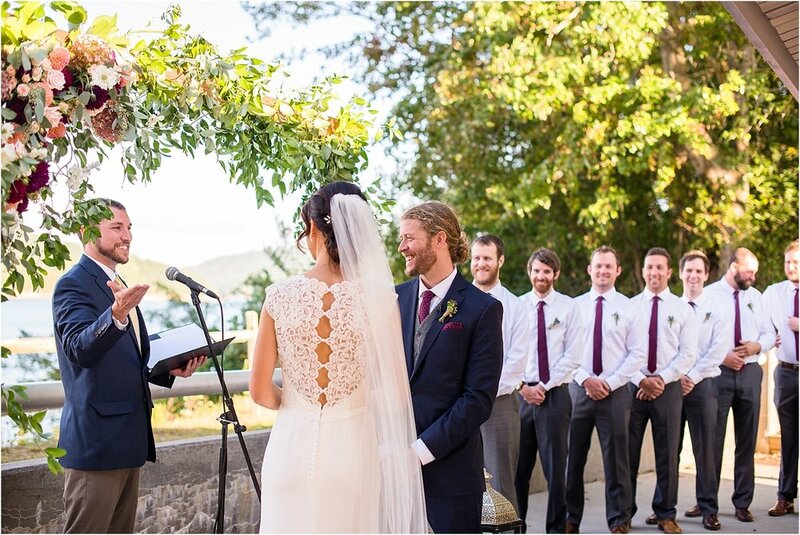 "One of our favorite memories is the moment when Dane, our friend and officiant, pronounced us husband and wife and we walked down the aisle together to 'Signed, Sealed, Delivered'", Autumn wrote to me. "Seeing so many familiar smiling faces and finally getting a moment alone together for the first time all day. It was an unforgettable feeling being with each other for the first time as husband and wife." Surrounded by love and warm afternoon light, we hung out with the wedding party as evening came closer. From the few moments we got to spend with Autumn & Bart's friends, it just confirmed what we already knew: these two are two of the kindest, some of the loveliest of souls. Both Doctor's, Autumn and Bart's life work is to help others. It's even evident in their love story the impact they've made not only to their friends and family, but also strangers. To me, I adore how in the midst of helping others, they always seemed to find each other. Autumn shares their story best, "We first met a year before we started dating through our shared medical training at MAHEC and Mission, but we got to know each other better on a Medical Mission trip to Honduras. Once we were back in Asheville we reconnected at an impromptu reunion party and we both realized there was something more than friendship between us. Once we started dating it was clear we had something special and the rest is history!" Jeff & I are always talking about chemistry. It's important to us that our brides and grooms feel relaxed and comfortable, and a big part of that comes into how they act and engage with each other. Sometimes, it takes a little coaxing to get them to warm up in front of a camera, but Autumn and Bart fit together like a glove! Once along together, the two had perfect chemistry - the perfect subjects for joy filled photos. Bart integrated their mutual love for nature into their proposal- which truly was only fitting. "We went on a mountain bike ride in DuPont Forest on the 4th of July," Autumn remembered. "We were cooling off in secluded Lake Julia and Bart went to get his phone so we could take a picture of the beautiful scenery. When he got back he got on one knee, pulled out the ring, in and we both cried and were on cloud 9 the rest of the day!" Is there a better way to ask the love of your life to marry you than to be surrounded by nature doing some of your very favorite things? Autumn & Bart's wedding reception at the Fontana Village Resort was truly one of a kind - and for reasons you may not expect. What separated Autumn & Bart's reception apart from the rest was their choice of band, a purposely folky, mountain-sounding group complete with cello's and banjos- ya know, the works! Nearly everyone had their turn on the dance floor, moving and grooving to local, bluegrass tunes. Autumn & Bart, thank you for the joy of allowing us to be your wedding photographers! Getting to know the two of you and be just a small part of your story has been such a blast. We wish you both the absolute best!